Soulumination is a non-profit organization founded by Lynette Johnson a Seattle photographer. The work of Soulumination is to celebrate the lives of children and parents facing life threatening conditions by providing professional photographs of these children and their families free of charge. 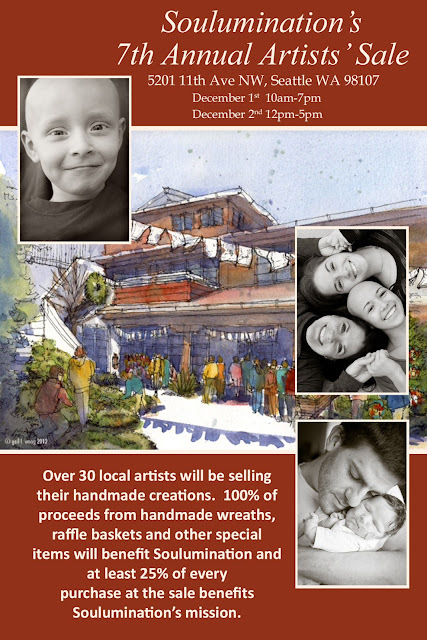 This year Soulumination will have their 7th Annual Artist sales Saturday- Sunday December 1 and 2nd. A portion of the artist sales goes to supporting Soulumination's work. I will have my notecards and my yearly calendar for sale. Hope you can come! Soulumination had asked me to do a sketch of their artist sale in the summer. This sketch was done on location, the people and decorations were from imagination to depict the sale. I gave them a jpg of the sketch for use in promoting their sale. Here is the original sketch and the postcard. Click on the Postcard for more information about the sale. Great sketch for a great casuse, Gail! Well done. I love the shadow of the flags.